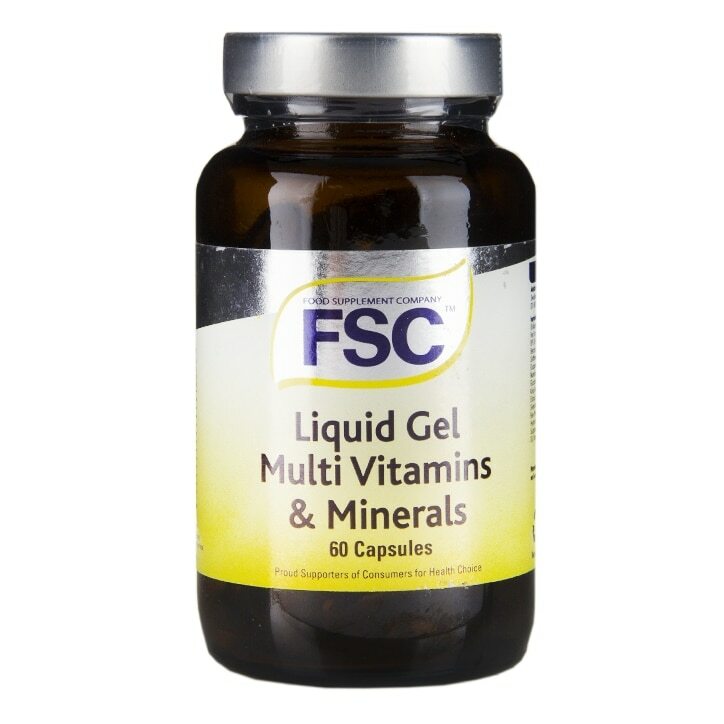 These liquid gel capsules contain all the vitamins and minerals your body needs to support general good health and wellbeing. It can be very difficult to get optimal amounts of nutrients from diet alone, and taking a simple daily supplement like FSC's softgels makes a complicated challenge very simple. These softgels are easy to swallow and the liquid format means your body can absorb and digest the nutrients quickly, so you can get on with your day. Capsule Shell (Gelatine, Glycerine, Carob Powder), Calcium Carbonate, Cod Liver Oil, Vitamin E (as d-alpha Tocopherol), Vitamin C, Magnesium Oxide, Safflower Oil, Hydrogenated Vegetable Oil, Magnesium Gluconate, Zinc Gluconate, Pantothenic Acid, Emulsifier: Soya Lecithin; Vitamin B12 prep, Halibut Liver Oil, Thiamine Mitrate, Vitamin B6, Riboflavin, Niacin (as niacinamide), Choline Bitartrate, Thickener: Beeswax; Ferrous Fumarate, Beta Carotene prep. (Anti-oxidant: d-alpha tocopherol), Inositol, Para Amino Benzoic Acid (PABA), L-Selanomethionine, Copper Amino Acid Chelate, Folic Acid, Boron Amino Acid Chelate, Chromium Amino Acid Chelate, Sodium Molybdate, Biotin, Potassium Iodide.